Firstly I’m impressed that WordPress has finally updated their phone app just as I’m testing out posting from my iPhone. Today I was on my own and decided it would be easier to train close to home than take the bike all the way to Sugarloaf Reservoir as I’d planned to do. 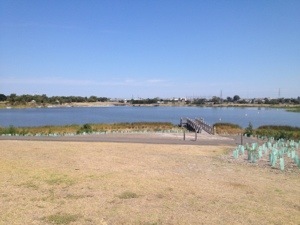 My hike began from home, detoured past the coffee shop for a small soy cap (this is urban hiking after all), then headed down to Karkarook Park to circle the 2.5km loop around the lake. 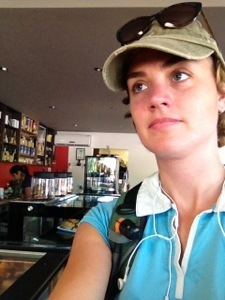 Self portrait whilst waiting in Bentleigh’s busiest Sunday morning cafe in my hiking get up. 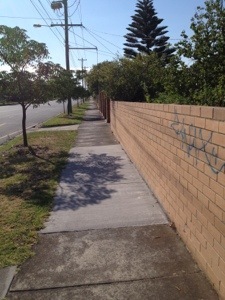 This ended up being an exercise of heat and distance conditioning as I walked in the heat of the afternoon between 10am – 3pm on a 30+ degree day, managing a total of 23km in 5 hours. More of the typical scenery enjoyed during my hike. I have to say I was waddling the last few kms home after doing 30 mins on the elliptical machine earlier this morning and taking the dog for a leisurely stroll before the hike. The new shoes were a hit except for a few stones that got stuck in the base of the shoe and rubbed my heel (should have worn gaiters!) May have to order another pair this week. I should also add that after only 5 hours of walking in the heat my shoes and clothes absolutely wreaked. There’ll be no jumping into a hot shower and throwing the clothes into the washing machine on the trail. Thank goodness I’m doing this hike solo!